Born at Hatherleigh, Devon, England on 1 October 1851, son of John and Susannah Hooper, brother of James Hooper, he started a career in his uncle’s office where he studied architecture. He came to Canada in 1869 and settled at London, Ontario where he was trained in stone carving and monument work. His family all went to England in 1878, but he returned to Canada in 1880. He spent one year at Emerson and came to Winnipeg in 1881 where his first work was that of a monument designer and builder, in partnership with David Ede. In 1893, having studied architecture in England in the office of his uncle, who was Surveyor of the Duchy of Cornwall, he commenced practice at this profession and was working again at Winnipeg at least by 1901. He was appointed the first Provincial Architect of Manitoba in 1904, holding the position until his death, when he was succeeded by Victor Horwood. 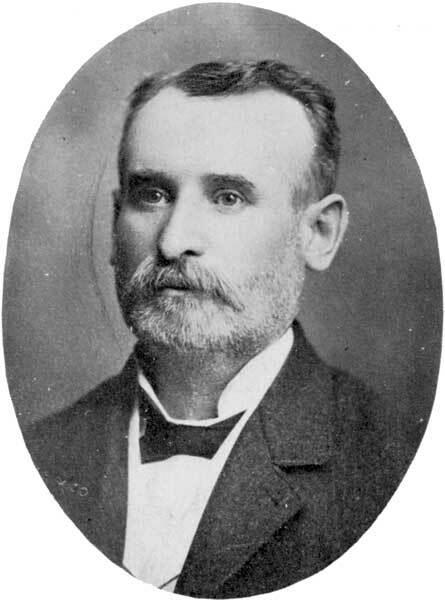 He served as President of the Manitoba Association of Architects in 1908. In 1872, he married Jane Ferguson Simpson (1855-1942) with whom he had four children: John Simpson Hooper, Gertrude Hooper (1882-?, wife of Lee Higbee), Samuel Lawrence Hooper (1888-1919), and Nina Simpson Hooper (1893-1962, wife of Alfred J. Webb). In the fall of 1911, he traveled to London, England to consult medical specialists and died there on 19 October 1911. His body was returned to Winnipeg for burial in St. John’s Cathedral Cemetery. Samuel Hooper, Dictionary of Canadian Biography XIV, 505-6. “Samuel Hooper died in London,” Winnipeg Tribune, 19 October 1911, page 1. “Samuel Hooper dies in England,” Manitoba Free Press, 20 October 1911, page 17. “Nurses 4 of 1 family who die in 3 months,” Winnipeg Tribune, 9 January 1919, page 1. “Mrs. J. Hooper funeral held,” Winnipeg Tribune, 26 September 1942, page 24. Obituary [Nina Webb], Dauphin Herald, 27 June 1962, page 4. We thank Robert Hill and Murray Peterson for providing additional information used here.